Get your floors cleaner than ever with this incredible mopping system. It will allow you to deep clean any floor to a streak-free shine without the use of chemicals. When plain old water is combined with this tool, it will remove 99% of all dirt, dust, and germs from any hard surface. 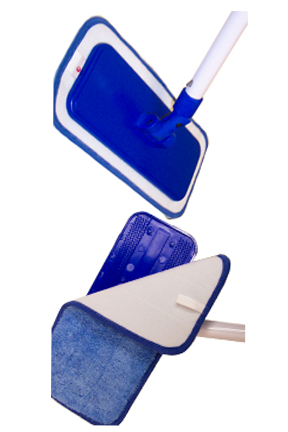 Each set includes a complete floor mop with telescoping handle, and two different pads that are totally reusable. It's similar in size to popular disposable tools, but it removes more dirt with less effort, and the cost of use is way lower. The compact head is small enough to be convenient and versatile, but big enough to get the job done quickly. The advanced swivel connection features a quick release attachment, and gives you the ability to maneuver into, under and around almost anything. It's safe for use on wood, tile, marble, linoleum or concrete, and the superior pads will never scratch or leave marks on any floor you clean. Perfect for household use, but durable enough to meet the demands of commercial cleaners, this set will outperform the competition, and it will reduce the time and effort required to mop your floors. Stop struggling with stinky sponges, yucky strings, or knock off versions that don't work as well. Our set has been tested for quality, so we can guarantee results. Reusable. Throw away tools are pretty popular because they are so easy to use. This one is just as easy to work with, but it actually does a better job. When you factor in the lack of replacements due to washable pads, it is also a way cheaper option. Top Quality. There are other microfiber mops out there, but they're not all equal. Other poles are flimsy in comparison, and other heads don't swivel as well, or they are prone to breaking. Cleaning ability is dependent on pad quality, and most other options have lower quality material. This makes them harder to use, and forces you to buy replacements sooner because they wear or fall apart with use. Locking Swivel. Pivot in all directions, or just a single one. The head can be set to a full swivel, or you can engage the lock to prevent side to side movement so it only bends back and forth in one direction. Improved Attachment. Other heads use fabric strips that the pads stick to. The material can flatten and wear over time, and this will reduce adhesion. This one has texture molded into the plastic, so it provides a strong grip that doesn't wear over time. Quick Release. The pole does not screw into the head. A quick release tab mechanism allows you to connect or detach much faster, but you don't lose any security. Versatile. Use on any hard floor, and clean any mess wet or dry. The combination of pads included in this set will allow you to mop any surface, and clean any dirt. Use them wet or dry, and on any hard surface, even windows. Powerful. Incredible cleaning power that's safe and gentle. Deep clean with just water thanks to the powerful material the pads are made from. It's never been easier to clean your floors. No special chemicals to mix, no heads to wring out, and no buckets to fill. All you need is regular tap water and this awesome set. Use the pads wet or dry depending on your needs, and use them over and over again without replacement. Although this tool is incredibly simple to operate, use the instructions below for best results. To use, select the appropriate pad, and ensure that it is clean. If using damp, get wet under the faucet, and the wring out until it is only damp. Attach the pad to the head by pressing into place. Set the handle to your desired length by twisting loose, extending, and then twisting tight to lock it in place. It can collapse to half size, and it can extend to full, standard length. You can also set it to anywhere in between. Clean floors by using a back and forth motion. For full coverage, begin at one side, and work towards the other. Overlap slightly for best results. To lock the swiveling head, twist the blue ring to the right and slide downward. Pole must be straight. Remove pads by pulling straight off. Remove without touching by stepping on the edge and lifting the mop upward. After a light mopping, just rinse the pad and let it hang dry for later use. Once a pad becomes completely soiled, machine wash and then dry for later use. 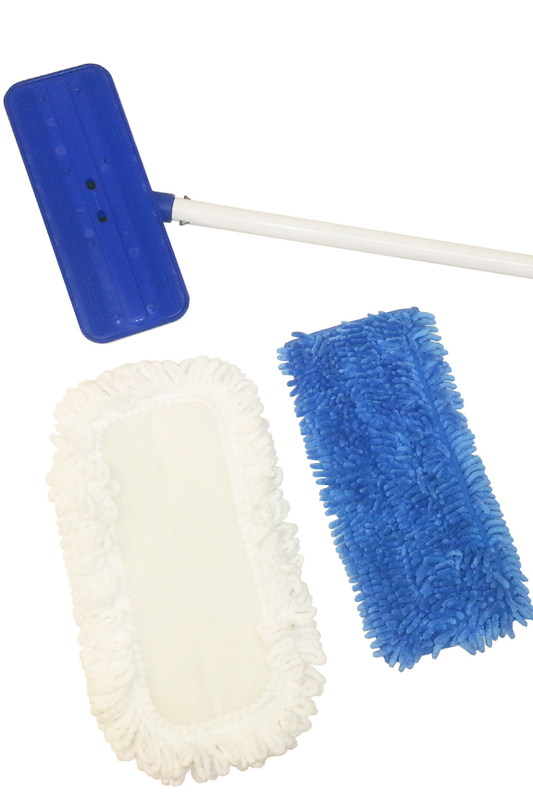 Our StarFiber microfiber mop set features a smaller twelve inch pad size, but it cleans faster, easier, and better than almost any other available. You will be amazed at how clean your floors are, and how easy it was to get them that way. The pads are constructed using the highest quality microfiber available, so they work better, clean faster and last longer than other brands. Each one can be machine washed hundreds of times before it needs to be replaced, and the versatile tool can even be used to clean ceilings, walls, windows, skylights and ceiling fans thanks to the 60" long telescoping handle. The super-absorbent, highly durable microfibers are 100 times smaller than conventional threads, so they cut through grime easily, but they won't ever streak, scratch or leave behind lint. While gliding effortlessly over your floors, the swivel head conveniently maneuvers into, under, and around difficult areas, so it will be easy to get under the bed, behind the toilet, into corners and other difficult areas. Discover a better way to clean, and do it without chemicals. Don't be fooled by imitations that only look the same, and stop wasting time and money with disposable tools, second-rate micro fiber, or traditional sponge mops. Get the job done sooner, and do it without frustration or hassle when you use this set. 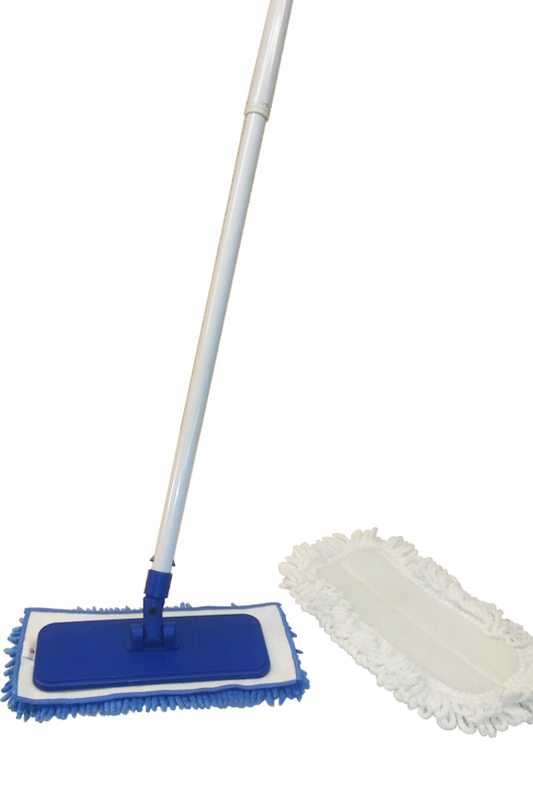 Pad Dimensions (l x w) 12" x 5.75"
Head Dimensions 10" x 4"
A StarFiber Mop Set for fast and easy mopping! Choose a chemical-free and environmentally friendly way to clean your floors. This tool works great on virtually any hard surface, & is perfect for hardwood, tile, marble, linoleum & more. I looked at MANY microfiber mops before purchasing. Our house is small (1300 sq ft) and all but two bedrooms have the hardwood flooring. This mop seemed to be a good combination of small size and good quality, based on the reviews I read. It seems sturdy and well made. I like the ease with which the microfiber part attaches to the mop head... Just press it in place and it stays put. So far I have only used the mop dry, and it seems to do a good job of picking up dust and small debris. I learned to use a different motion than when sweeping with a broom. I pushed the mop ahead of me in overlapping figure eights, which seemed to be the most efficient. This is MUCH faster than using a broom! Before mopping the floor I used the mop to brush down the walls and remove some cobwebs. The long handle helped me reach all the way up to the 12' ceiling. This was a good buy and I'm pleased with my purchase. This is the very best mop I have ever used. It is great for cleaning floors, washing walls, washing windows and I can't say enough good things about it. I searched and searched for a company that carried it as my 12 year old StarFiber mop and pads wore out. I am grateful Simplygoodstuff offered the set. I bought one for my sister and my mother as well. It makes cleaning so easy and it does a thorough job! It works great. Just wish it had a longer mop head. My whole house has hardwood floors. The blue mop head has "snapped" off!! I need a new one but can't find the same style. I don't know if the ones available will fit the handle. My mop head is 13" at the bottom and 15 across the top.. Anybody have any suggestions????? Love the mop otherwise! I love this mop. It makes cleaning up after a houseful of rescued cats and dogs on my hardwood floors quick and easy. I was wishing a mop like this existed, then I found it while browsing the internet. Here's how I use it: I wet the blue mop pad and wring it out. I toss it on the floor, fuzzy side down. I place the mop head on top and it grabs the fabric mop pad. I mop the floor. Occasionally I pull the fabric mop pad off the plastic mop head and rinse and wring it out again. While mopping, if I LIFT the mop head and handle up, the fabric mob pad sticks on. It's so simple and easy to use. If I want to do a quickie wipe-up, I can even just toss a cleaning rag on the floor and push that around with the mop head and handle. The pointy grips on the bottom of the plastic head hang onto whatever wet rag I'm using. Perfect. Easy. Love it. Hi there, Yes, I have had a chance to use my mop. I really really like it. I especially like using the blue mop. It cleans my laminate floors so beautifully. I also appreciate that I can throw it in the washing machine and reuse. Thanks for such a great product. I researched a new mop set online for quite awhile and this one won. I have been happy with the price and value. It works well and adjusts quickly when I have children of various ages using it. I love my mop. It is the best because it actually picks up dust and dirt instead of just pushing it around. Then the pad can be washed so that it is clean to us again. The only thing to be careful of is the stick. It appears to be collapsible to easily move. However, you can only collapse it once. The second time, it will no longer tighten in the full length and needs to be replaced. simplygoodstuff response: It sounds like you received a defective handle. You should be able to adjust it up and down as many times as you want. If yours does not work like it should, please call or email with your order number, and we would be happy to ship a replacement. This got such great reviews, but I don't find it to be that great. The two pads just sort of velcro on to the head of the mop. They don't really stick that well. It does an okay job, nothing outstanding. I love this system so much that I have three! I bought this mop set for my elderly mom. I gave her a spray bottle filled with a water/vinegar mix to spray on her kitchen floor, then mop with dampened mop head. Much easier to use, cleans efficiently and safer for her - no messing with sponge mops & buckets of water. She called to thank me for introducing her to this mopping method...so much easier! I bought 4 of these and shared them with family. Doing ceilings is a breeze. My mother has been using this same mop for years and I finally found them at simplygoodstuff. She was afraid she couldn't find them anymore. She is a happy "camper" cleaning lady! Thanks! Better than a sponge. Better than a string mop. Better than a paper disposable mop. Cleans all types of floors. From vinyl to hardwood. I have constant spills on my kitchen vinyl floor. Gets everything with little effort. Pop the pad in the wash with other microfiber cloths and boom. No fuss. No mess. No hassle. No constant expense. Add a little water and no scrubbing. Easy to maneuver. Fits EVERY nook and crevice. Easy to change out pads. Cleans EVERYTHING. Can even wipe the walls down. Tall and slender easy to store. I absolutely LOVE this mop. I just got in from a 12 hour night-shift. I had to try the mop. Holy cow!!! We have 4 dogs and laminate wood floor in the kitchen and foyer. I just walked around barefooted and don't even feel dirt or grit. This mop is four in one. Convenient for storage purposes. Great for all my floors. Does this mop come in a larger head size? Is the mop handle plastic or aluminum? Neither. It's made from steel. How to assemble and attach the micro fiber wand? This mop comes with a specialized pole that sort of pops into place instead of screwing. It works great for a secure fit with the mop head, but it will not connect to the microfiber dusting wand like other, more standard, mop poles do. You would need a pole with a regular threaded end to attach the microfiber duster. does the handle come apart for easy transporting? No. It doesn't screw apart like cheap ones do. It's telescoping, so it's much more sturdy, but still able to collapse down to half the size for transport or storage. can I buy only one mop? Yes. We just offer reduced pricing for anyone ordering more than one in a single order. A Super Absorbent Mop With Built-In Wringer. 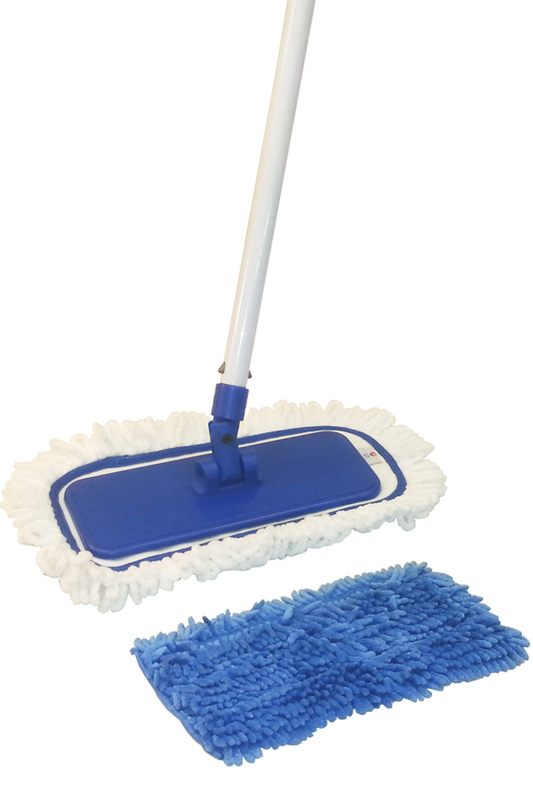 A powerful microfiber mop by Starfiber. Complete with 1 Heavy Duty Pad and 1 Multi-Purpose Pad.